I'm not an NBA fan by any means, but a while back, I ordered something off of Ebay, and the seller added a bunch of basketball cards as filler to my package. 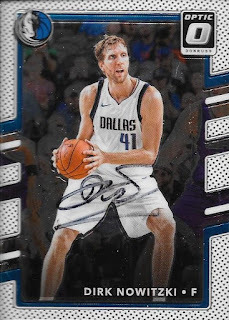 One of those cards was this Dirk Nowitzki, and I had seen some folks get him TTM. So, I sent it off and waited for it to come back. It finally did, but the signature wasn't too great. It's there and all, but it would have been nice if it were better. Oh well. Nowitzki (b. 1978) has played in the NBA since 1998 for the Dallas Mavericks. He is a 13-time ALl Star and won the NBA championship in the 2010-2011 season. He has scored a total of 31,275 points in his career and was the NBA MVP in the 2006-2007 season. I don't know a whole lot about basketball, but I imagine he will be a Hall of Famer at some point, for sure. I mailed to Nowitzki on September 29 and got the card back signed on January 19, for an 111-day TAT.